WASHINGTON -- Republicans are "just getting started" clawing back President Obama's health care reforms and reshaping the dialogue in Washington, Senate Republican Leader Mitch McConnell said today at the Conservative Political Action Conference (CPAC). "We're not about to retreat," McConnell said at the annual Washington gathering, which attracted tens of thousands of conservatives. He called the health care reforms the tipping point that galvanized the conservative movement to make a comeback. Democrats have slammed Republicans, now that they control the House, for continuing to focus on a repeal of the new health care laws, even as the economy continues to flounder. McConnell countered today that the GOP should continue its fight against the reforms - regardless of what voters think - because Republicans should stand by their principles. "When we started this debate, the president's vision of reform had the support of about 70 percent of the American people," McConnell said. "But here's the problem: We didn't swear an oath to uphold whatever's popular. We swore an oath to uphold the Constitution." "And according to the Constitution, nobody in Washington has a right to force anybody to buy something against their will," he added, referencing the line of attack conservatives have used in their court challenges against the legislation. McConnell filed a brief in support of one of the pending lawsuits, one of which could very well end up heading to the Supreme Court. "Republicans will keep fighting it in the House, in the Senate, in the courts, and at public forums throughout the country until Obamacare goes the way of Hillarycare," he said. Incidentally, former House Speaker Newt Gingrich spoke at the CPAC conference directly following McConnell and cited polls showing Americans are in favor of repealing the health care reforms as reason to keep pushing for repeal. 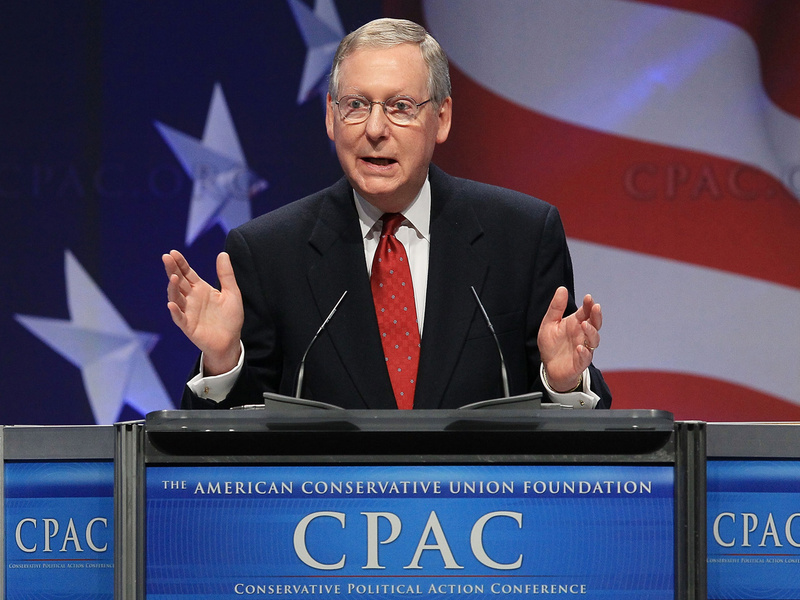 Nevertheless, McConnell urged the conservative activists at the conference to "never confuse what's popular with what's right." He added, "If we do our jobs, popularity will take care of itself." Indeed, a recent Gallup poll showed the Republican party has won its first positive approval rating since 2005. Still, fewer than half say they have a positive opinion of the party. McConnell noted today that Republicans have managed to focus the debate in Washington this year on reducing government spending. "We're having a serious debate right now about how free enterprise can stimulate our economy, not how the government can create jobs," he said. He struck an optimistic note, declaring that Republicans "have embarked on our comeback."